Most kids love to have their daily bowl of curd. Most of the mommies too feel extremely satisfied giving it to them. Curd makes for a wholesome and super beneficial alternative to milk. It can be tweaked in multitude of ways to make it interesting and healthier. However, as winter sets in, we mums develop cold feet (literally and otherwise!) in giving curd to our little ones. With one three-year-old and a baby just about nine months of age, I was always torn between the dilemma of whether to give curd to my kids in winters or not. All opinions I took from family and friends too were inconclusive. So I decided to take matters in my hands, look up facts, and find out what really is good for my children. I went ahead to find answers to common questions like when should I start giving curd to the baby? Whether I can continue giving curd during winters? If yes then how, and how much? If you too are a mum stuck in similar dilemmas, hope this write-up will help you make an easy decision either way. Is it alright to give curd to kids during winters? Even experts have a difference of opinion when it comes to giving curd to children in winters. According to Ayurveda, curd stimulates secretions in glands. As a result during winters it easily leads to mucous accumulation in the nose and chest, causing cough and cold. This might not happen in very healthy children with strong immunity. However, kids prone to allergic reactions to cold, food items, or pollen already have a compromised immune system. When given curd during winters it can aggravate the discomfort and make them fall sick. Nutritionists, on the other hand, vouch for curd any day simply because it is full of nutrients. 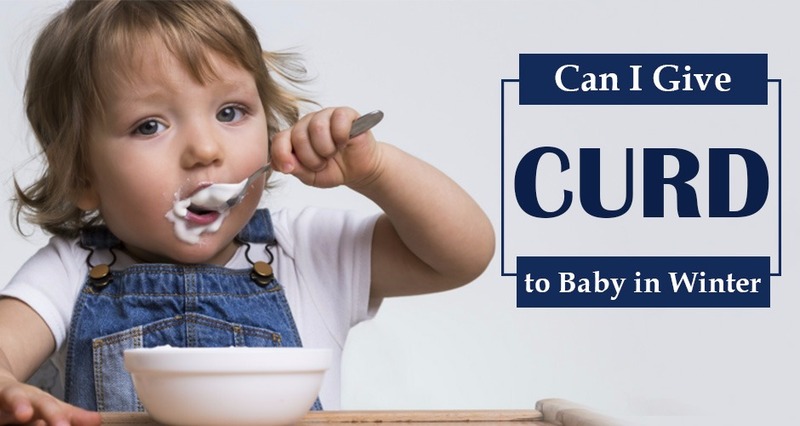 Curd is a rich source of vitamins A, B, D, E, C, B12, and K. It also contains minerals such as potassium, calcium, magnesium, phosphorus, sodium, iron, and zinc which can help immensely in the overall development of your baby’s body. Nutrition experts believe that over time if curd is given to kids on a regular basis, it also helps to boost and strengthen their immunity. There are so many reasons to give curd to your child! Here are 7 which come to mind. It is common knowledge that during winters the body takes time to digest food, probably due to cold. Curd is made by culturing milk. During this process, lactose that is present in milk is broken down. This makes it easier for the baby to digest curd. A lot of my friends overseas also introduce cheese to their children when they begin to eat solid food for the same reason. Children who are lactose intolerant, sometimes, have no difficulty with eating curd. Even when they are allergic to whey or any other milk protein, yoghurt does not seem so hard for them to digest. The bottom line is that the milk proteins in curd are simplified for the body to digest. Curd is one of the best probiotics available in the Indian kitchen. It contains a species of bacteria called lactobacillus. This is found in the intestines and the urinary tracts of human beings naturally. It aids digestion and keeps the body protected from disease-causing bacteria. Children have a tendency to eat junk food and end up with upset tummies. A few spoons of curd everyday help balance out the gut flora and prevent tummy aches and loose motions. If your child is facing any gastric issues, yoghurt can be very soothing and helps reduce any irritation in the stomach lining. With every cup of curd you get about 400 mg of calcium. When you give your baby at least one spoon of yogurt each day, you help the bones get stronger. With one cup of curd you get proteins that are almost equivalent to one egg. So, if you belong to a vegetarian family, curd should be a staple in your child’s diet. Proteins help kids stay active and satiated for long. They improve body metabolism and of course, proteins are essential in helping the tissues in the body grow and repair themselves. Sleep can be a major issue with several children. They are either too full of energy or are just unable to fall asleep for various other reasons. Curd is extremely soothing and calming in nature. So a little bit of yoghurt at lunch time during winters will help both you and the baby to catch a cozy wink, snuggled together. Curd is known to cure several health issues. The probiotic bacteria found in curd helps with any infection in the urinary tract. For children with liver related diseases like jaundice or hepatitis, curd is highly recommended. It reduces the formation of ammonia in the liver, reducing these conditions. This is why buttermilk and yoghurt are highly recommended in Ayurveda as well. Based on this information I realized that the solution lies in taking the middle path here. Neither is there a need to completely abstain from curd during winters and nor should one give bowls full as we usually do in summers. The key lies in regulating portion sizes as per your kids’ need. 1. Store curd in a container at room temperature. Avoid giving chilled or refrigerated curd to kids. 2. Always give curd to children before sun down as once it starts to get colder, curd intake causes cough in kids with asthma or allergies. Even though my kids aren’t allergic I started giving them curd around 11.30 a.m. just before taking them to a nearby park to play or at lunchtime. 3. Always regulate the portion during winters. Half a cup should suffice at a time. Remember that it is an accompaniment and not a replacement in your child’s diet. 4. Avoid giving curd to the child when her cough and cold are at their worst. Wait for a few days for the infection to subside and then resume again. flavoring agents and even growth hormones. Always opt for homemade curd for your little one. Instead of sugar you can add powdered jaggery or honey to cut down its mucous forming tendency. You should avoid mixing curd with bananas or cucumbers as that leads to phlegm build-up during winters. Instead of cool raitas, you can make garlic raita in winters by adding some sautéed roasted garlic and onion paste to curd and giving it a tarka of salt, curry leaves and cumin seeds. This also prevents phlegm build-up. When should you introduce curd to your baby? When introducing curd to a baby, make sure that you do it when the weather is neither too cold and nor there are too many allergens (pollutants, pollens, husk, etc.) in the environment around that time of the year. It is important to do so because that way if your baby shows any allergic symptoms to curd you will know instantly instead of confusing them with side effects of cold or environmental allergens. My son was a little over 6 months old when he was given his first spoon of curd. He did not have any issues with it. Doctors recommend 6-7 months as an ideal age to start byproducts of milk; as by that time the baby has developed a taste for milk itself and will not replace it with something tastier. Curd is a very good starter when you want to introduce semi-solid food to the child. You can team it with mashed bananas, stewed apples, boiled and mashed carrots, potatoes, rice, and more for variation. However, remember the thumb rule that every new food that you introduce to your baby should be introduced one at a time. It is best that you maintain a gap of three to four days between every new food introduction. This allows you ample time to monitor your baby’s reactions to that food item. Therefore, if your little one develops any allergy you can isolate the problematic food item, even if it is curd. When introducing the curd to a baby or toddler it is best to make it at home using 100% organic milk. Although expensive, this milk is free from chemicals and residues of growth hormones given to cows. Therefore, is a much healthier option. When you do decide to give curd to your child during winters it is important to keep watching out for any symptoms such as cough and cold. Give importance to your instinct as a mother when it comes to your little ones irrespective of what you decide and never hesitate to change course if you feel its not working out in the best interest of your child.